Does targeted KO = Damage? Thread: Does targeted KO = Damage? If I field and pay to KO , would Hulk deal damage to all my characters? To ask it in a more general way, is KOing a character always considered to be damage? Q: If a character with a game effect that is triggered by taking damage is KO’ed by a game effect, does their game effect occur? A: No, effects that KO characters (or ones that move characters to different zones) are not considered to be damage dealt to the character. As an example, Thor, Legendary Warrior’s ability to knock out characters when he deals damage to an opponent is not considered to deal damage to the character and, therefore, his ability would not activate any game effects triggered by taking damage on the character that he knocks out with this ability. I kinda feel dumb for asking a question already posed in the FAQ. I certainly deserve the Narnope. Thanks so much guys! TRPers are the best. Razorback, i am sorry, that was not my intention, there are no dumb question !!!! ever!!!!! It was a reaction to Bestia and because i like this Kitty Card Game <3 . But yes, if you want you can be the Narnope and spear up people that deserve a NOPE , because you can!!! @Ressless I was not offended in the least. I took it all in good fun. I simply should have done a better job researching before I posted. All the same, I'm grateful for quick answers. And especially for being introduced to the narnope. That is awesome. "Hey man you could distract just his Blockers so you deal double damage to him, thats even more awesome!" And i was, "Ehhhhh really? I dont think soo..."
"Dude we should read the cards we bring along sometimes at least to know what we are playing! X_X"
Last edited by Ressless; 08-10-2015 at 11:58 PM. 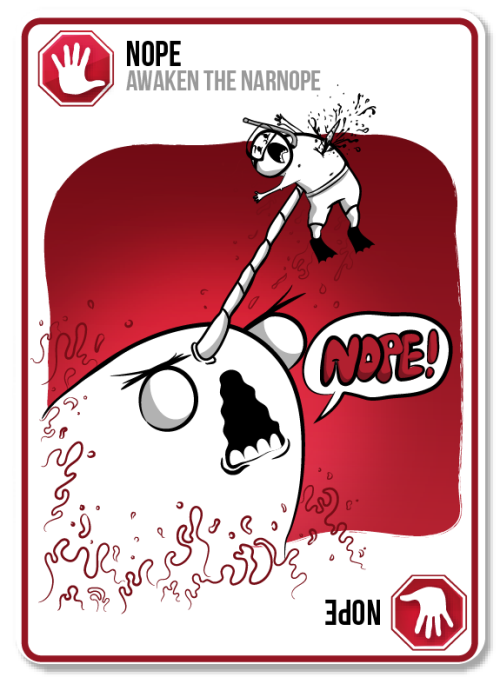 If I now post a Nope card does that make it a Yep? Does that satisfy you SIR? "Dude we should the cards we bring along sometimes at least to know what we are playing! X_X"